At times, we wish to capture larger areas of deep space that our telescope and camera field of view does not cover in one frame. Other times, we purposefully want to capture multiple small segments of deep space in order to join them up later, thus producing very high resolution images. Whichever the aim, mosaics are fun to produce but take some care to do correctly. The tool we will employ is a small subsidiary to the popular EQMod that controls telescope mounts via ASCOM. 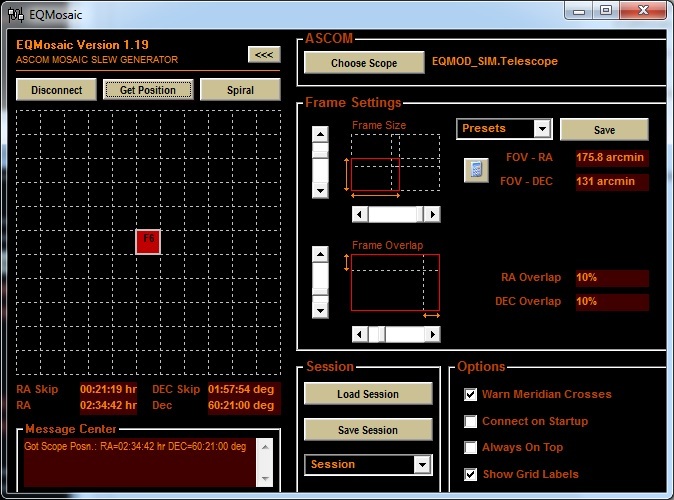 You will therefore need to be controlling your telescope mount using ASCOM in order for this tutorial to apply. The small extension tool is known as EQMosaic and can be downloaded free from this link. Please download and install the latest version before starting this tutorial. 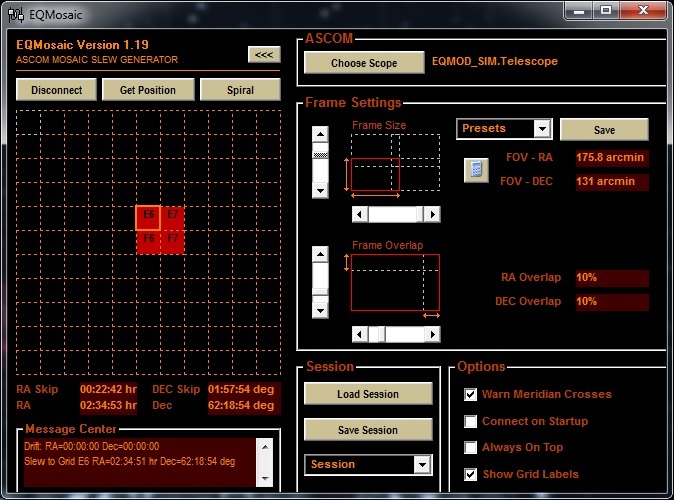 Please note that for this tutorial, I will be using the ASCOM simulator and Stellarium with StellariumScope (for goto). You are welcome to use the also-popular Cartes du Ciel, which has the same capabilities. It is necessary to first orientate ourselves with our target region of deep space. We need to decide what it is we want to capture and how we want to orientate the camera. 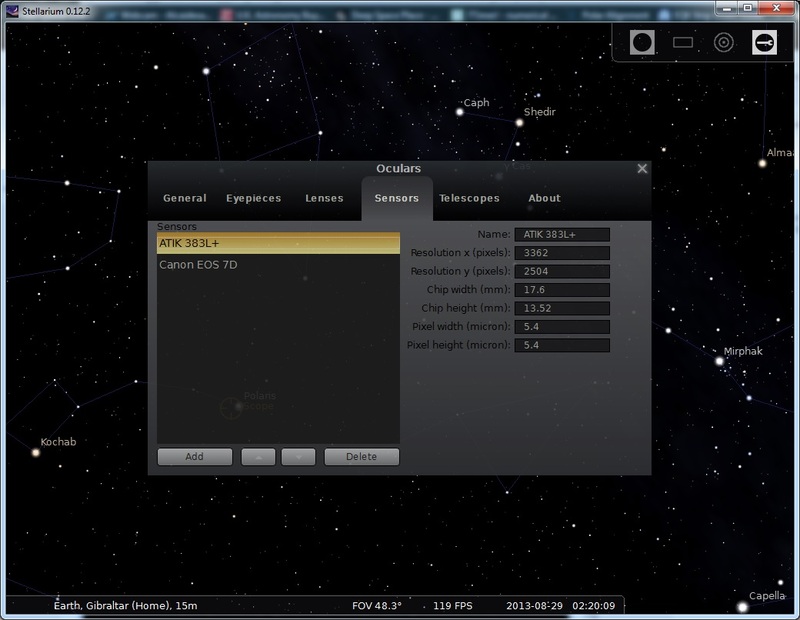 Stellarium is an excellent program for this because it provides a tool to project your telescope-camera field of view and show you the night sky in equatorial mode (as your telescope will see it). Before starting, ensure the GPS co-ordinates in your ASCOM software and Stellarium match precisely. Let us say for now that I want to image the nebulosity below the constellation of Cassiopeia. 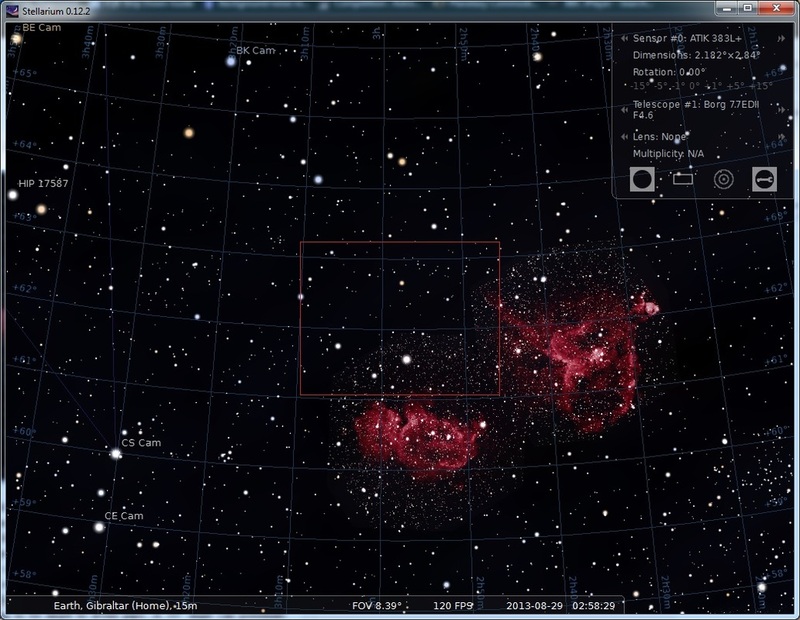 I want to do it with a wide-field setup, say a Borg 77EDII telescope and ATIK 383L+ CCD camera. 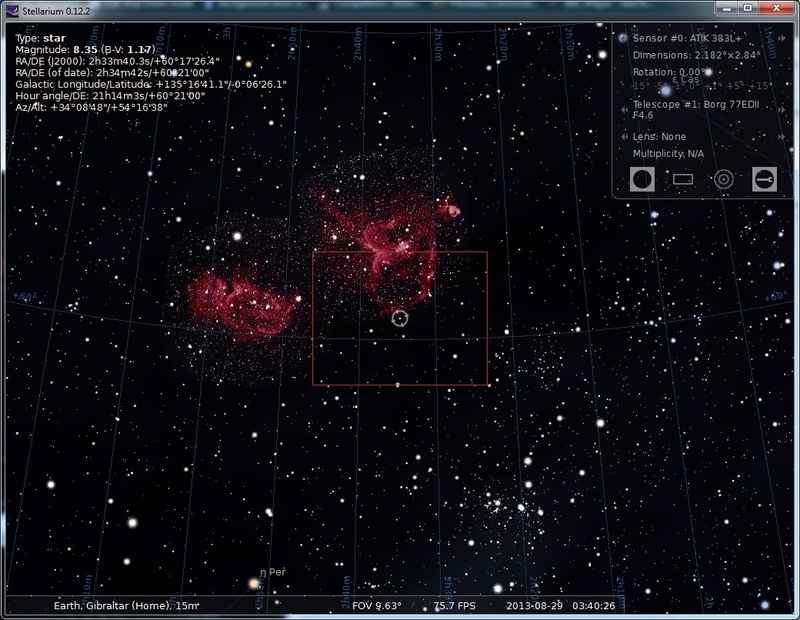 I will first add these to Stellarium so that we can see the field of view produced. 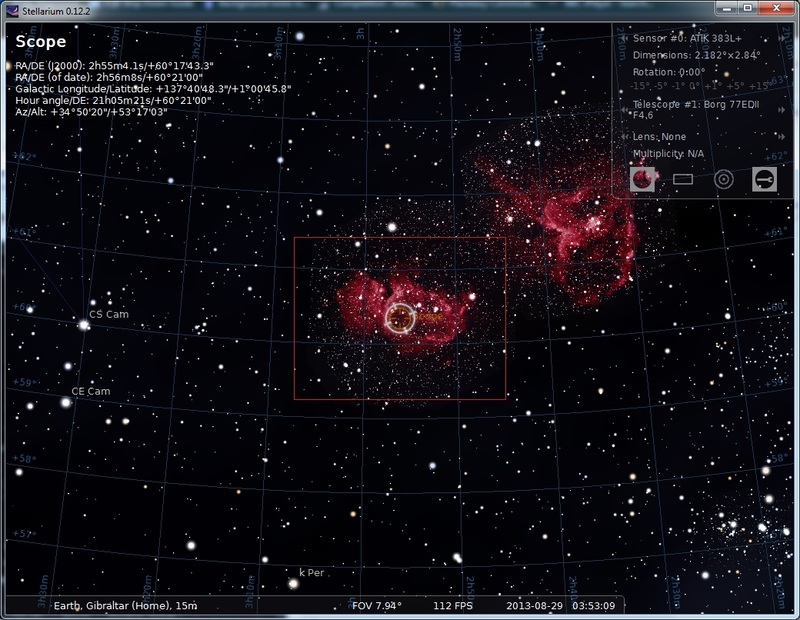 For this, we click the spanner icon on the top-right corner, the Oculars plugin configuration. I will first add the CCD camera. Go to the Sensors tab, click Add and then fill in the relevant details. You will need to consult your CCD sensor's specifications to know precisely what to enter. I got this CCD sensor's details from ATIK's webpage for the CCD camera. Now I will add the telescope. 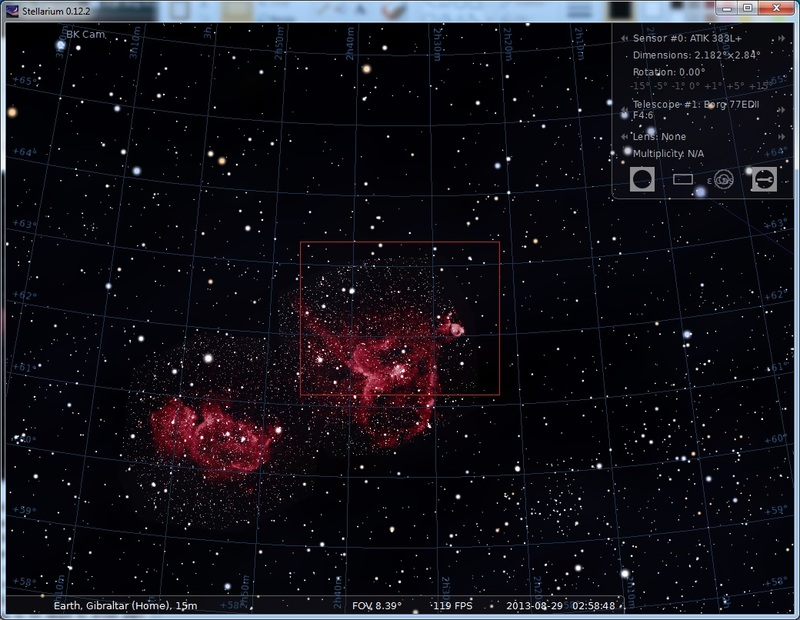 Go to the Telescopes tab, click Add and again fill in the relevant details. This is much easier as all that is asked for is a name, the focal length and the diameter (both in millimetres). 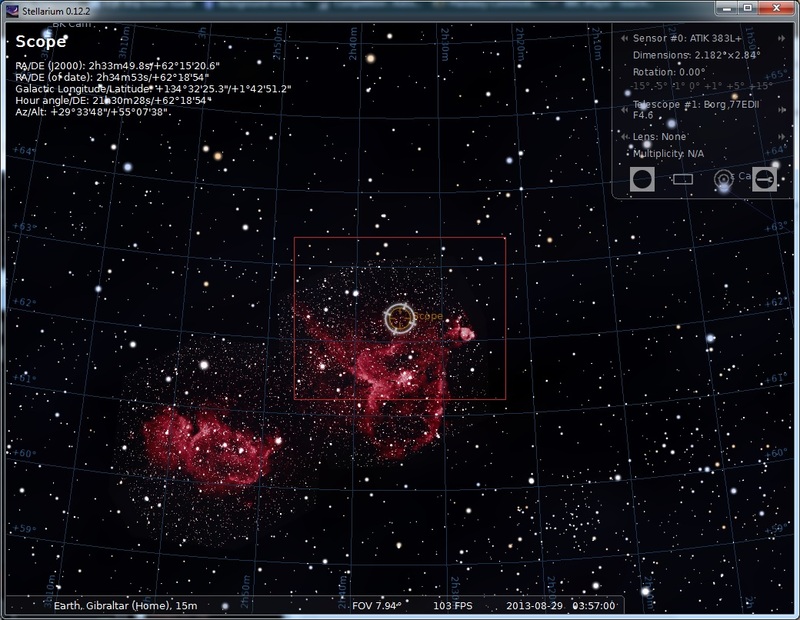 Once added, close the configuration window and we are ready to check out the field of view produced against deep space. Simply find your area/object of interest (press F3 to initiate a search if needed) and then click the rectangular icon on the top-right corner, the Image sensor frame button. Ensure the correct CCD camera and telescope are selected on Oculars plugin (if you have more than one of either added, it may have another telescope-camera setup selected by default). 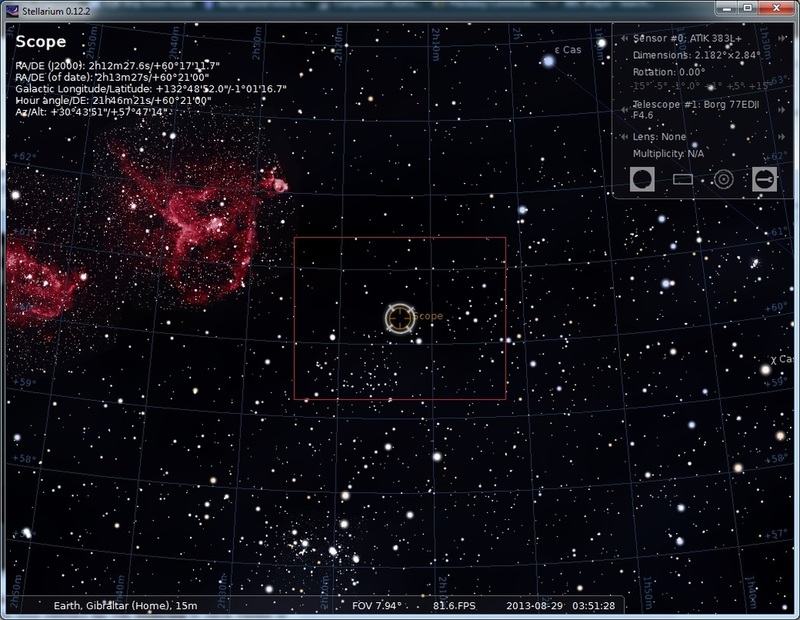 We are now observing the area of deep space that would be captured by our chosen telescope-camera setup. Though this is helpful, we need to see the night sky in equatorial mode to match what our camera would actually capture. For this, simply click the Switch between equatorial and azimuthal mount button along the bottom toolbar (or press CTRL M). If we also click the Equatorial grid button along the bottom toolbar (press E), you will see the equatorial grid overlaid on the night sky. The reason to enable this is simple but takes a little explanation beforehand. EQMosaic works by you providing a starting position in the night sky. 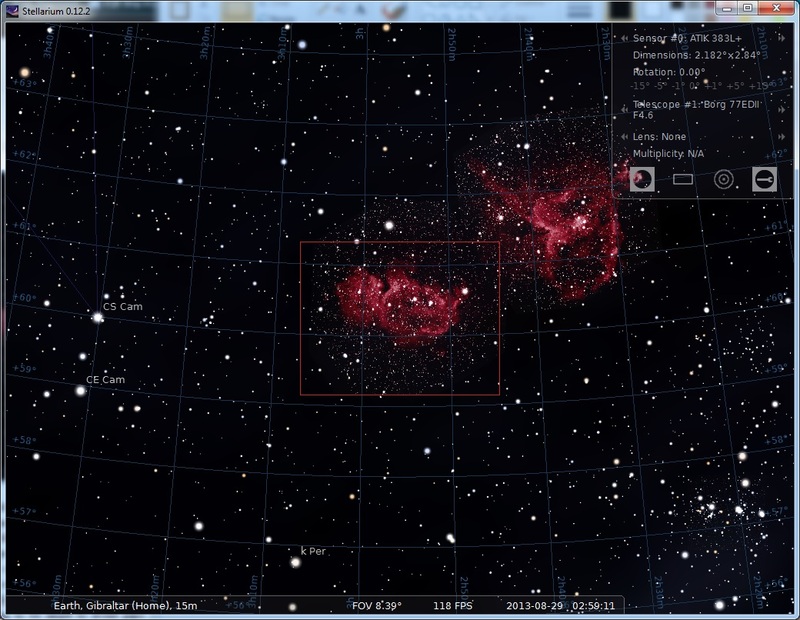 From there, you can ask EQMosaic to offset your telescope in Right Ascension or Declination along a 2D grid. The offsets are calculated based on your field of view and your chosen overlap percentage between mosaic segments. An important point here is that the field of view is calculated as a perfect square-on rectangle along the equatorial grid. In other words, EQMosaic will assume your camera is aligned perfectly perpendicular to Right Ascension or Declination, never at an angle. If you choose your rotate your camera in the focuser by say, 30°, EQMosaic has no way of knowing this and will still offset your mosaic segments as if the view was perfectly square-on rectangular (as shown in the above screenshot). Therefore, if you are sure you wish to image at an angle such as 30°, please note you can do so but you will need to increase the overlap percentage later to avoid gaps. However, if you want to avoid potential issues, it is best we stick to 0° (as shown in the above screenshot) or 90° (clockwise or counter-clockwise, it is the same). 0° and 90° both result in a perpendicular alignment of the camera with respect to the equatorial grid and then your overlap percentage in EQMosaic will match mosaic segments across the entire length of the images. In the above screenshot we are seeing the camera in its default angle, 0°. Play around with framing your target to see what fits best - 0° or 90°. To rotate the field of view by 90°, just click the -15° or +15° buttons on the Oculars plugin six times until the angle is +/-90° (again, clockwise or counter-clockwise as it does not matter). 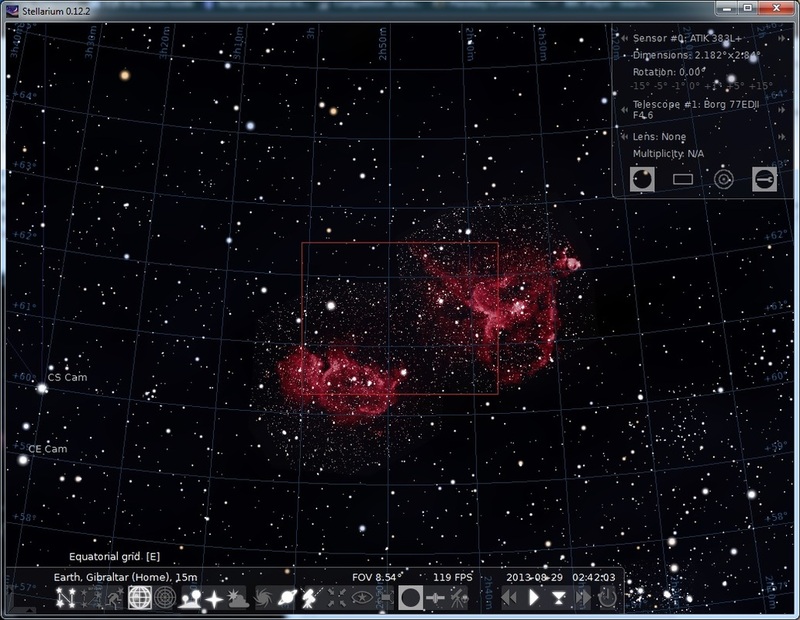 For this particular target with my particular field of view, I could capture everything shown in Stellarium by producing three mosaic segments with the camera at 90° (mosaic segments next to each other). However, this would make the image a bit too long with little height for my taste. I would prefer to image four mosaic segments and with the camera at 0° instead. I prefer this purely because it will maintain the aspect ratio of my camera but it does imply having to image four segments rather than three. It really is totally up to you what you do as per your mosaic plan. However, remember the point about camera angles. 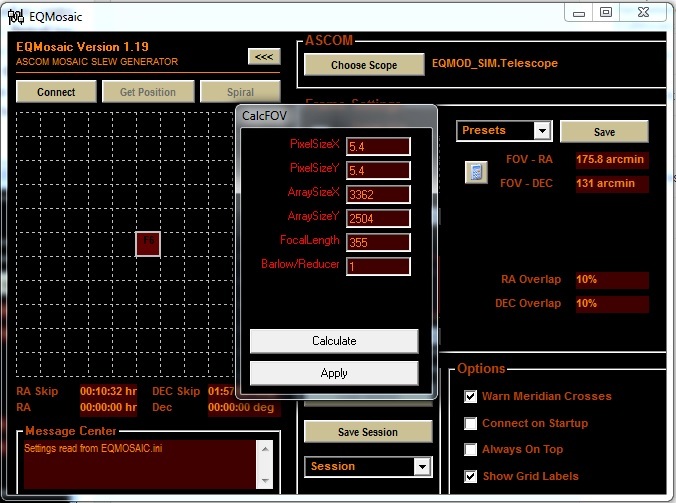 Feel free to use whatever angle you like and even mark your focuser with an angle measurer if need be, but do remember about EQMosaic's overlap percentage having to be larger to avoid gaps. A 30° angle can potentially require upwards of 20% overlap rather than 10% that would suffice for 0° or 90°, remembering that overlapped space is essentially wasted imaging area of deep space, only useful to join up the mosaic segments. The following four screenshots show what I plan to image for this object as a mosaic. Above, I was careful to move the field of view rectangle across my desired area of deep space ensuring some overlap of stars but please note this is only important so you get a general idea of how EQMosaic will offset your telescope and therefore check whether your plan is plausible. A nice point to insert here is that you might have two telescope-camera setups, one capable of imaging this whole area of deep space in one frame and this one, requiring four mosaic segments to image the same area. What to choose? You might just say, "I will just use the wider-field setup and reduce my imaging time four times!". Fair enough, but consider that what you will end up with is an 8.3 MegaPixel image of the whole region (I use the ATIK 383L+ CCD camera here as the example). Choosing to instead image this region with your narrower-field setup and doing it in four mosaic segments means you will effectively have a 33.2 MegaPixel image of the region. Now that is a whole lot more detail to behold! That is the beauty of mosaics. EQMosaic is a fairly easy tool to get your head around. Run it and you will be greeted by a fairly simplistic grid with a couple of buttons. The Connect button is used to connect to the telescope mount. The Get Position button is used to centre (synchronise) your starting point on the grid to your's telescope's present location in the night sky. Spiral has a special function we will explore later. Below the three buttons you have the grid available for mosaic segments. F6 is always your starting point and subsequent segments are named similarly. Below the grid you are given the Right Ascension and Declination co-ordinates of segments as well as the offset from the starting point. To set up EQMosaic with our field of view and overlap percentage, click the arrow icon button at the very top-right to expand the configuration. We will start with configuring the field of view. Click the calculator icon button under Frame Settings. 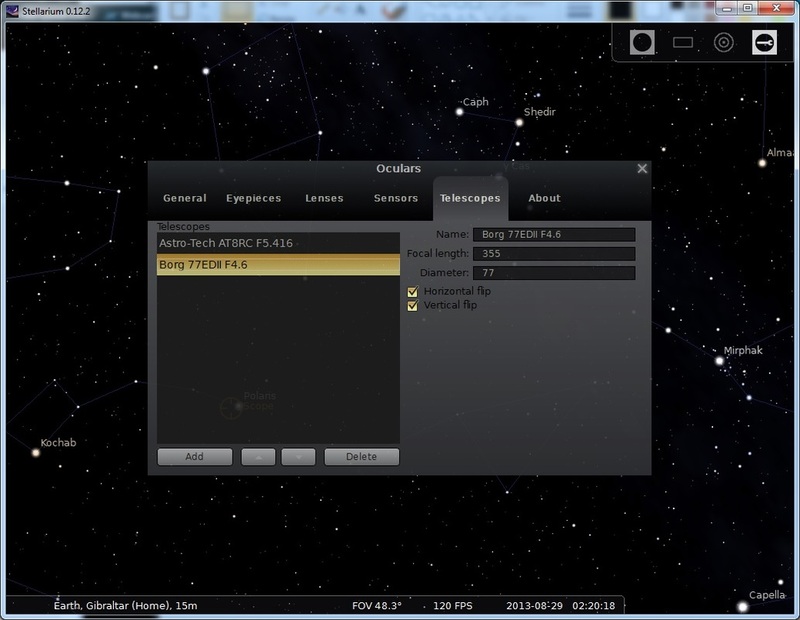 Here we have to enter similar details to what we had to enter in Stellarium, so you should already know what to enter for your telescope-camera setup. The first four fields (PixelSize and ArraySize) are essentially to do with your CCD sensor whereas the last two fields (FocalLength and Barlow/Reducer) are to do with your telescope. I never touch Barlow/Reducer and instead just alter FocalLength based on how my telescope is configured. Once you have entered your details, click Calculate and then click Apply. FOV - RA and FOV - DEC on EQMosaic should display the correct field of view. Before we proceed I want to caution you about the field of view. See how FOV - RA is larger than FOV - DEC? The reason is obvious - the CCD sensor is a rectangle and images as such. 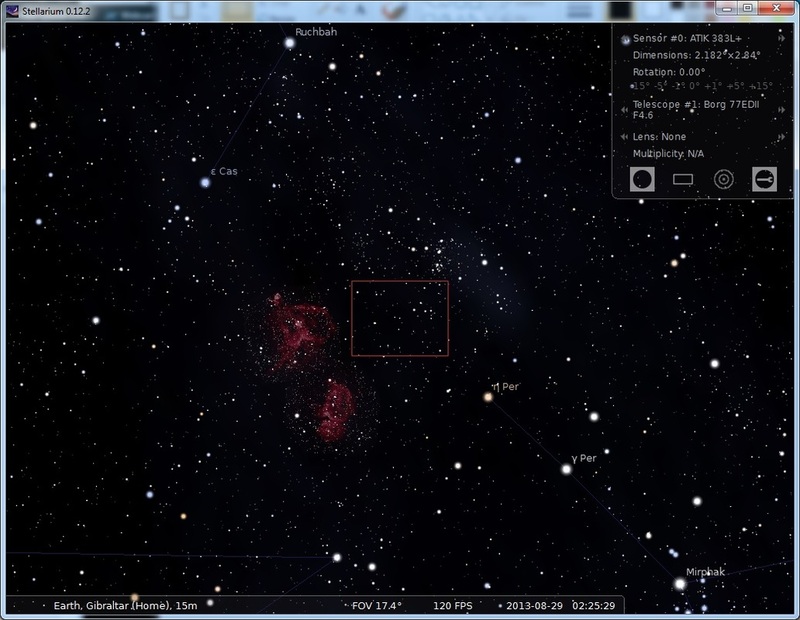 Now, look at the field of view rectangle on Stellarium whilst on equatorial mode. You will see that indeed the rectangle is longer along Right Ascension than Declination. It is therefore correct that FOV - RA is larger than FOV - DEC and not the other way around. Therefore, this is what we want for our camera angled at 0°. If you have actually set your camera at 90°, you simply need to swap ArraySizeX and ArraySizeY (in my case, I would enter 2504 for ArraySizeX and 3362 for ArraySizeY). This will also swap the field of view on Right Ascension and Declination such that FOV - DEC will be larger than FOV - RA - in other words, EQMosaic will know your camera is at 90° and not 0°. Please keep this in mind. To set the overlap percentage, simply increase/decrease the two sliders for overlap in Frame Settings and the percentage will change accordingly. I prefer keeping both Right Ascension and Declination on the same overlap percentages, particularly since I image at 0° or 90° to keep things nice and trouble-free. In my experience, 10% to 15% is sufficient when you make sure you camera is indeed in the correct angle in the focuser (if off, not off by very much at all). You can save presets for the field of view. All you would need to do is alter the text in Presets and click Save. A nice idea here might be to save your field of view for 0° and 90°, maybe even for multiple telescope-camera configurations. Once you are happy with your field of view and overlap percentages, we proceed to actually create the mosaic in EQMosaic. We first need to execute a goto command to slew the telescope to our target region. Before we do this though, choose a starting point. For example, I have four mosaic segments I want to image. Choose the one that will be your starting point and we will create the other three mosaic segments from offsets in EQMosaic. Choosing the starting point is not arbitrary if you want things to be optimum. 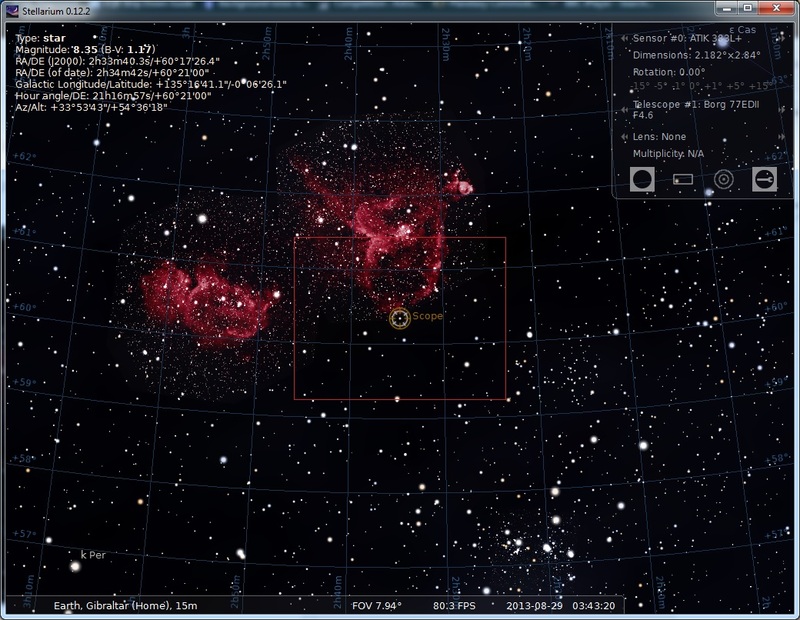 You need to pick a star that it more or less central to one of your mosaic segments so that Stellarium can actually perform the goto command (otherwise it has no idea where you want it to point). Consider this as well: you cannot image all four mosaic segments in one night and will need to return another night to finish. The second night, you slew to your target but is it centred as it was the first night? AstroTortilla (free plate solving software) can ensure that and another tutorial will help you set it up if you want to use it. Looking at my planned four mosaic segments, I note the third image segment actually has a nice star that is pretty much central to it. If you cannot find a central star in any of the mosaic segments, do not worry, just pick one that is close to being central. When you select a star, press SPACE and your view will centre the star so you can precisely see the field of view rectangle overlapping your region of interest. Above you can see this is very, very close to what I wanted as my third mosaic segment so I am happy to set this as my starting point. I press CTRL 1 to perform the goto. This would be a good point to start using AstroTortilla. Are we really centred on the target star? If you have not performed a goto alignment, probably not and even if you have, we may not be perfectly centred. If the starting point is not centred, the other mosaic segments will not be perfectly on target either. So what are we imaging then? Start using AstroTortilla! 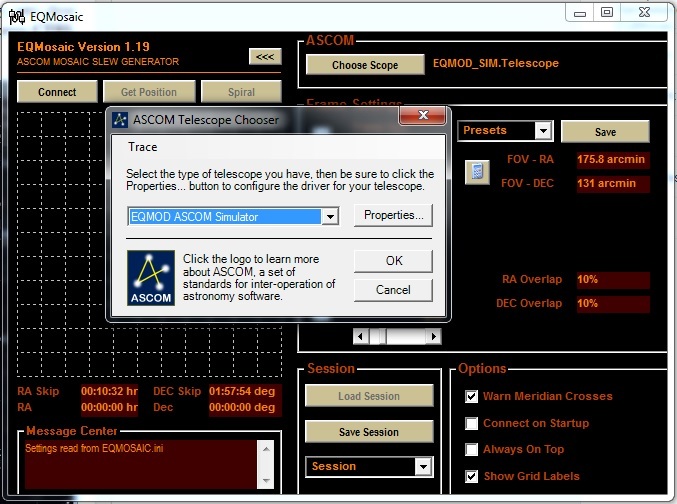 Now that we are on target, I choose the telescope from EQMosaic and then click Connect to connect to it (remember I am using the ASCOM simulator for this tutorial). 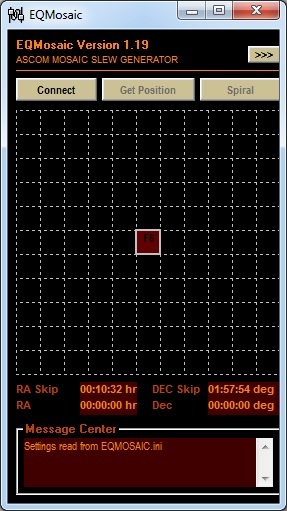 To ensure EQMosaic knows where we are starting from, I click Get Position to synchronise the telescope's current position to the starting point F6 on the grid. What we will do now is double-click on the little grid squares beside F6 in EQMosaic to slew the telescope to an adjacent mosaic segment. We will need to cross reference this with Stellarium to check whether or not we have chosen the correct mosaic segment as per our imaging plan. A nice trick here is to click the Scope crosshair in Stellarium and press SPACE. This will centre the telescope location on the night sky in Stellarium and so if you slew, the field of view rectangle in Stellarium will move to follow the telescope. For example, I double click F5, to the left of F6 and this is what Stellarium now shows me. Oops, we appear to have gone off target! To correct this, double click F6, which is your starting point and the telescope will slew back to where it was. Since we clearly do not want F5 as a mosaic segment, just click Get Position to delete everything and re-select your present position as the starting point F6. So, let us click F7 to the right of F6. Perfect, we are on the right track. F6 to F7 and vice versa represent an offset along Right Ascension and not in Declination. 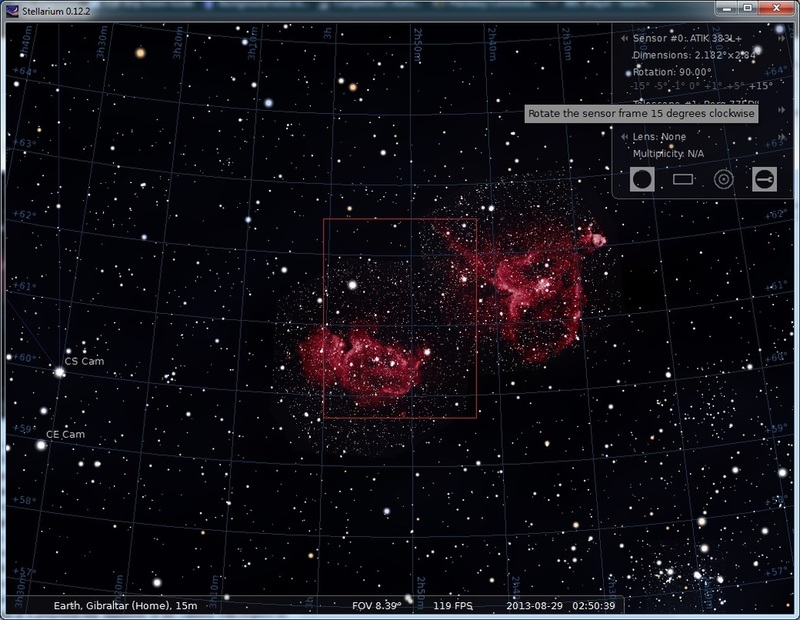 Clearly to image the other two mosaic segments above, we need to now offset in Declination. I will double click the mosaic segment immediately above F7 to check where it goes. This has created the point E7 in EQMosaic. Still on the right track, it is obvious that E6 (right above F6) is therefore the last mosaic segment and indeed it is. 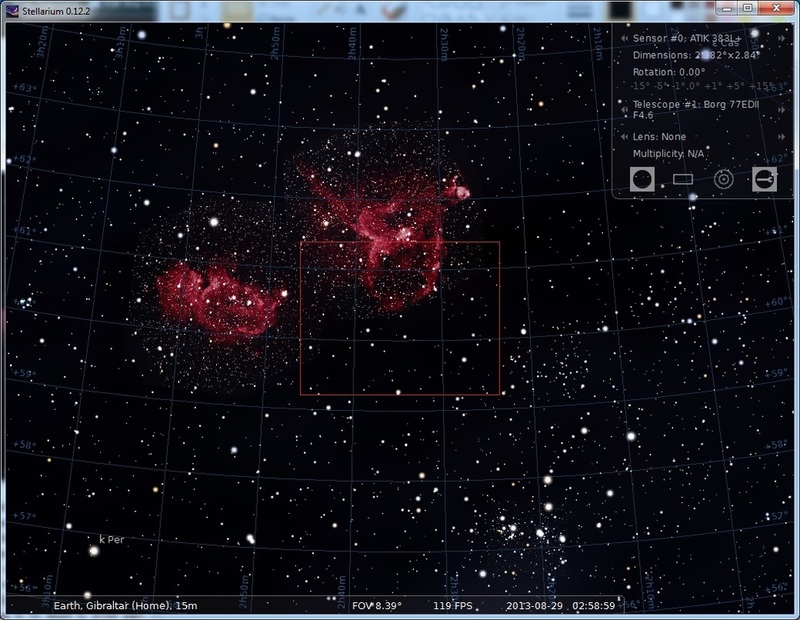 There we are - four mosaic segments created in EQMosaic which clearly match our target. If at any point you have made a mistake by going to a grid point that was not relevant to your mosaic, just double click F6 to return the starting point and click Get Position to reset EQMosaic and start over. 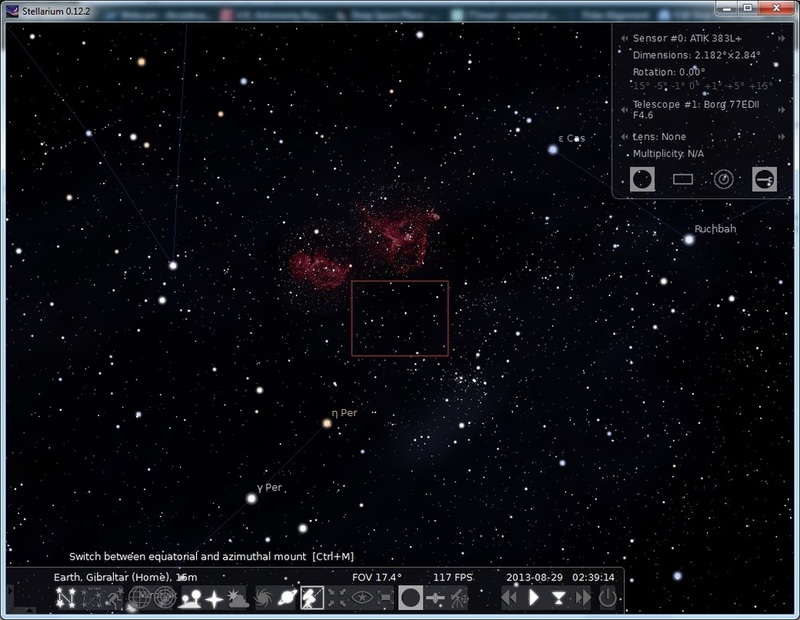 As you double click your created grid points in EQMosaic and watch the field of view rectangle move across the night sky in Stellarium, you will appreciate that indeed there is a nice overlap between mosaic segments and obviously it is this overlap that allows you to stitch the segments together later. 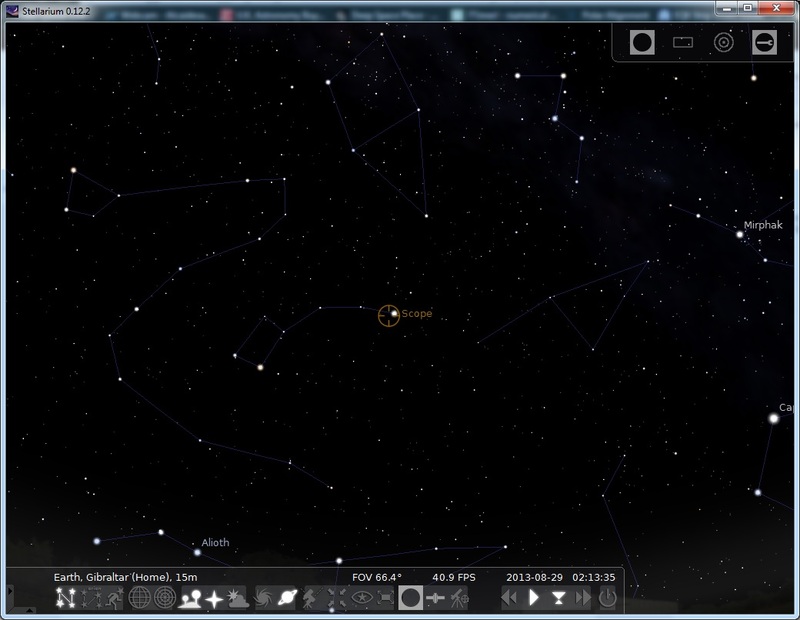 If you are not seeing the overlap in Stellarium's field of view rectangle, it is probable your EQMosaic field of view does not match Stellarium's. Check that indeed EQMosaic's field of view matches your camera's 0° or 90° angle. 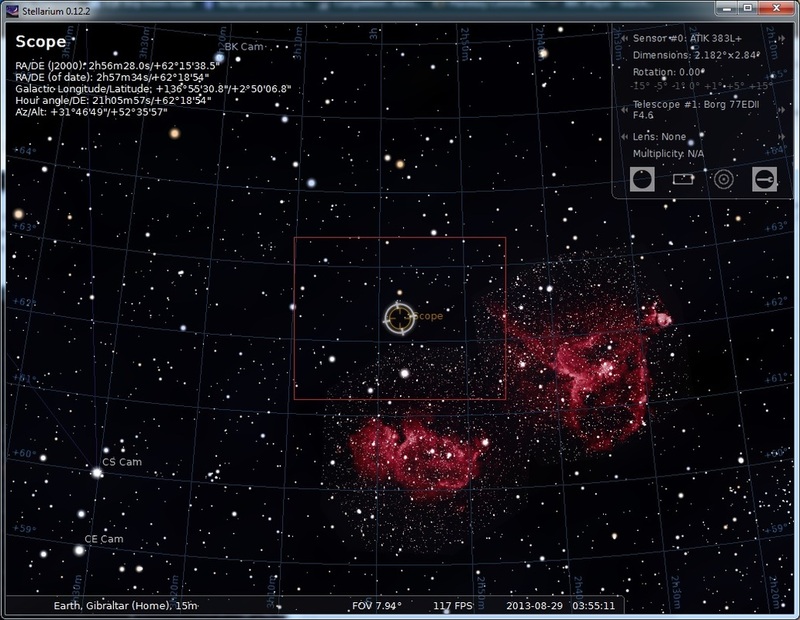 Remember, using an angle that is not 0° or 90° will stop you from being able to see the overlap in Stellarium across the entire length of the field of view. To avoid potential gaps, increase the overlap percentages for Right Ascension and Declination. Since we will no doubt have to return to image a second night, I will save this session. Under Session, I enter a name and then just click Save Session. Get your telescope and imaging equipment set up just like the previous night, with polar alignment done and with the telescope in the home position. Unpark the telescope mount in your ASCOM software. 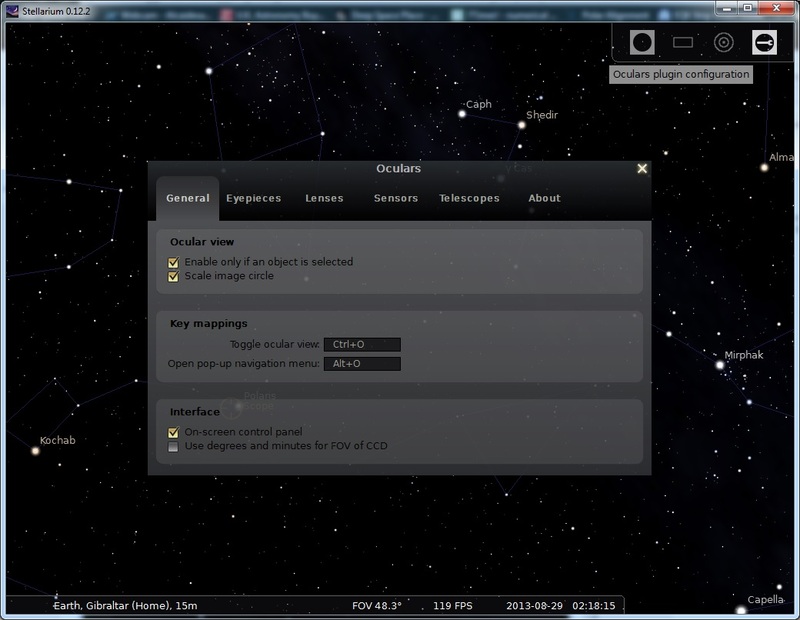 Open Stellarium and EQMosaic, connecting to the telescope mount in both. Select your EQMosaic session from the list and click Load Session. The telescope will automatically slew to the starting point F6. 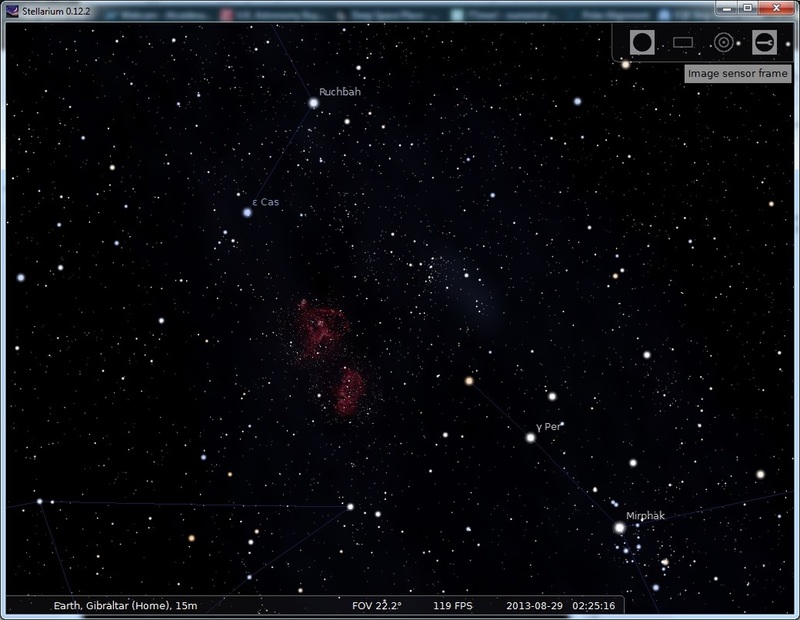 Confirm this in Stellarium. Use AstroTortilla to make sure you are indeed centred where EQMosaic intends. Double click the mosaic segment on the EQMosaic grid that you wish to image and image away! I stress point 4 above. Without plate solving, you will probably be misaligned from one night to the next and may encounter problems stitching together your images later. Do not waste your time imaging - use AstroTortilla! I promised I would cover the Spiral function of EQMosaic. Now that you are fully aware of how to operate EQMosaic, Spiral is simply a button that automatically generates mosaic segments in a spiral fashion about your starting point F6. That is all it does. Most likely you will not use this function unless you have a massive target or very, very small field of view (or both!) and are starting from the very centre, spiraling mosaic segments outwards until you cover everything you want to cover (e.g. imaging the Moon with a planetary CCD camera or webcam in a long focal length Schmidt-Cassegrain telescope). You need to be smart about this and plan ahead, especially if imaging in monochrome. What filter do you use first? It is best to image in Blue when the target is as overhead as possible and it is best not to image in Luminance when the Moon is lighting up the night sky. However, how does all that fit in with your imaging plan from one night to the next? Are you simply going to image Luminance first across all segments, then Red, then Green and then Blue? This may not be optimum as you will be imaging Blue across a wide range of angles in the night sky, for example. Perhaps it is best to image one segment completely at a time? Plan ahead! No doubt as a good astrophotographer you will be capturing multiple exposures of each filter, for each segment. Name your segment images appropriately. Perhaps include the grid numbers from EQMosaic in the filenames, or just call them segment 1, 2, 3 and 4. It is up to you but do not allow yourself to get disorganised in the heat of the moment. Perhaps create folders for each separate segment and sub-folders for each filter, or be smart with filenames. Backup your images from night to night. Mosaics tend to involve multiple nights of imaging and there is nothing more infuriating than losing your previous night's images for not backing them up. Calibrate each of your segments separately. Treat each mosaic segment as if it were its own standalone image when it comes to calibration with darks, bias and flats. Do this whether your images are colour or monochrome. Stitching your images together is not something to be done manually. Remember that each segment may actually have a slightly different brightness along edges. Also remember that you must stitch your images as a large mosaic before any other post-processing. Post-processing should only be carried out once your images are stitched together as a large mosaic otherwise you will find yourself with a disaster. Above all, despite the hard work, enjoy creating mosaics. They are absolutely remarkable, especially when you decide to image something as a mosaic on purpose to create very high resolution images.